From CLP this Dyn style blue breakfast bar stool is a modern and minimal take on the classic bar stool design. 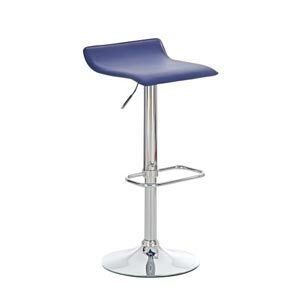 With no backrest this height adjustable bar stool features a blue leatherette seat that can be adjusted from 60 cm in height up to 78 cm. Available in a number of colours this blue kitchen stool is eye catching and would look great in a set around a kitchen table or lined up along a breakfast bar. This bar stool is rotatable through a full 360° angle and is stably kept in place by its large circular chrome metal base that compliments the colourful seating area perfectly. The bar stools height can be easily adjusted thanks to the lever located under the right hand side of the faux leather seat that measures 38 x 36 cm. For further comfort and stability the kitchen stool features a rectangular footrest bar that protrudes outwards from the bases stem allowing for easy mounting and dismounting onto and off of the stool. If you are looking for something that looks a little different to this bar stool or perhaps are after a kitchen bar stool that has a backrest then why not take a look at some more of the colourful bar stools that we have on our website in the chairs and stools category where you will find a wide variety of coloured breakfast bar stools and chairs that will fit perfectly into your kitchen environment.